Happy st Patrick's day badge in white with an Irish flag pattern shamrock design. 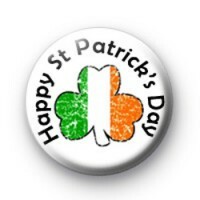 These badges are perfect for celebrating Ireland's favourite celebration, St Patrick's Day. With all the luck of the Irish. Standard 25mm badge hand made in our UK workshop using British badge components and manual hand press badge machines. Metal badge with plastic coated design and copper pin back.